From behind the pallet jack is where you should be positioned to start, because this is where you will control the manual pallet jack. The jack has a big vertical stem that should come straight up with a lever in the top rounded part, this lever allows for the pallet jacks prongs (the long flat medal forks closest to the floor) to be dropped to the floor, in order to pick up your pallet load. You will then pull in the drop lever so the prongs can then be lowered. You will not see any movement of the prongs if they are already as low as they go. They should be about an inch or two off of the ground. Place the prongs under the skid or pallet by pushing it through the openings on the bottom of the pallet. 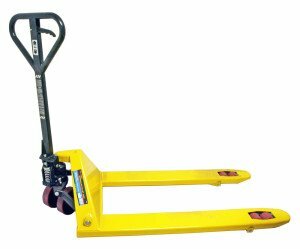 Use the handle to jack up the load/pallet. When the prongs are beneath the pallet put the stem/handle toward your body away from the load, in order to control direction. Always make sure your aisles or walkway is clear so you can walk through safely. Please do not confuse driving a forklift with driving a car. They are NOTHING alike. 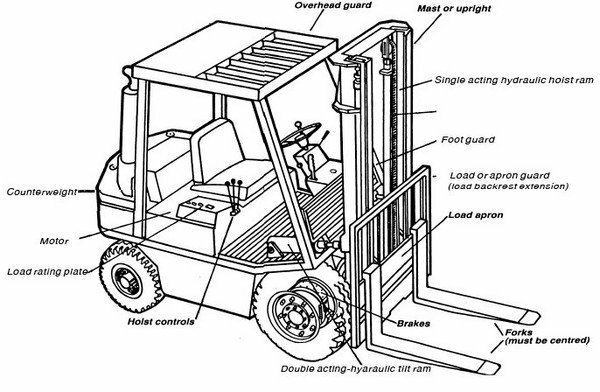 Forklifts are steered by the back wheels. The weight of the forklift is not distributed well at all, therefore they are very clumsy, and you must be very careful. All the controls are usually opposite. In most workplaces you will need a forklift license and/or a specialized training course. Always be sure to clear a checklist before operating the equipment. Look over the forklift for any malfunctions or damages, anything that looks like it may prevent the lift from working the way it is supposed to. It is also extremely important to pay a little more attention to the tire conditions on the lift as well as the hydraulics. Inform yourself as much as possible with all the controls, buttons, shifts, and meters. You can do this by going over an operations manual to the vehicle. Make sure your forks are always the correct width and height to pick up the load you are trying to move. This is to make sure you don’t knock over or damage the product/load. To be sure the weight is balanced correctly, only lift your load high enough to be able to move it. If you lift it too high you may tip over, damaging the product, the vehicle and worse harming yourself. Be sure your work area is always clear of debris or any messes, boxes etc. You won’t want any obstacles in your way that you may not see while operating the forklift. First and foremost follow all guidelines of the particular style of cantilever racking you choose, you can do this by informing yourself of safe installation requirements, and weight capacity restrictions to simple do’s and dont’s. It is critical to learn this information so that employees or persons working with these structures may be properly trained to prevent injuries. It is very important that the cantilever racking structure be in flat level, and square condition. Do not overload any component, bay or rack system, make sure you’re using the correct amount of arms so the divided weight does not exceed arm weight. Evenly distribute products and materials among rack arms to prevent unbalanced loads. Do not place the load and then push back, always place the load flush to the back of the arm. Position arm space according to the products and materials you’re storing to prevent excessive side to side overhang. Always allow adequate aisle spacing and maintain adequate clearance around loads. 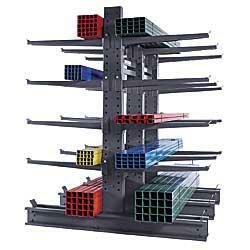 Do not cut, weld, or in any way modify any component of your cantilever racks. Ensure that you schedule your annual routine inspections and maintenance of your racking systems, also make sure you replace any damaged or missing components immediately.